South Africa is brimming with bold, creative innovators and entrepreneurs. As a country, we can lay claim to many innovations across a wide range of sectors. 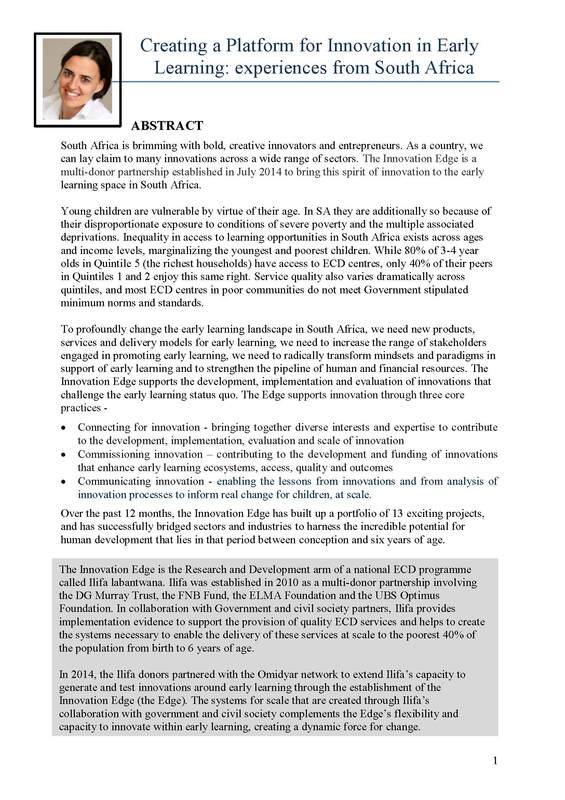 The Innovation Edge is a multi-donor partnership established in July 2014 to bring this spirit of innovation to the early learning space in South Africa. Young children are vulnerable by virtue of their age. In SA they are additionally so because of their disproportionate exposure to conditions of severe poverty and the multiple associated deprivations. Inequality in access to learning opportunities in South Africa exists across ages and income levels, marginalizing the youngest and poorest children. While 80% of 3-4 year olds in Quintile 5 (the richest households) have access to ECD centres, only 40% of their peers in Quintiles 1 and 2 enjoy this same right. Service quality also varies dramatically across quintiles, and most ECD centres in poor communities do not meet Government stipulated minimum norms and standards.